How does one go about hanging art on a brick wall? Hanging art on a brick wall is a cinch! All you need is 5 minutes, a drill, a hammer, those plastic anchor thingys and a common 1/2″ masonry bit! Once you figure out where you want to hang your picture, drill into the mortar, NOT the brick. The brick may crack and leave you with a whole new set of problems, whereas if mortar gets a crack it tends to stay within the mortar, which makes it easier to fix. Mortar is typically stronger than brick, but is easier to drill into. You don’t want to drill into the flue or chimney of a fireplace, for instance. If you’re no good at guessing how far an inch is, measure an inch on the bit and wrap some masking tape above that part and only drill in until you come up to the tape. Then insert the plastic anchor sleeve. Be careful not to bind it, but a few light taps of the hammer should do fine. Put it all the way in until the edge is flush with the wall. The anchors usually come with screws, but you may need to find one of your own. Screw it into the anchor’s hole and leave the head of the screw sticking out ¼” or so. Hang your art by its hanging wire on the protruding screw, step back, and collect your accolades! At Jackson’s We Take Pride in What We Do! Nobody has the level of Training, Education, Awards, Distinctions and International Acclaim that We Do! One of only FOUR Guild Commended Framers in Canada! One of only 17 Advanced Guild Commended Picture Framers in the world!!! International People’s Choice Winner in Orlando, Florida! 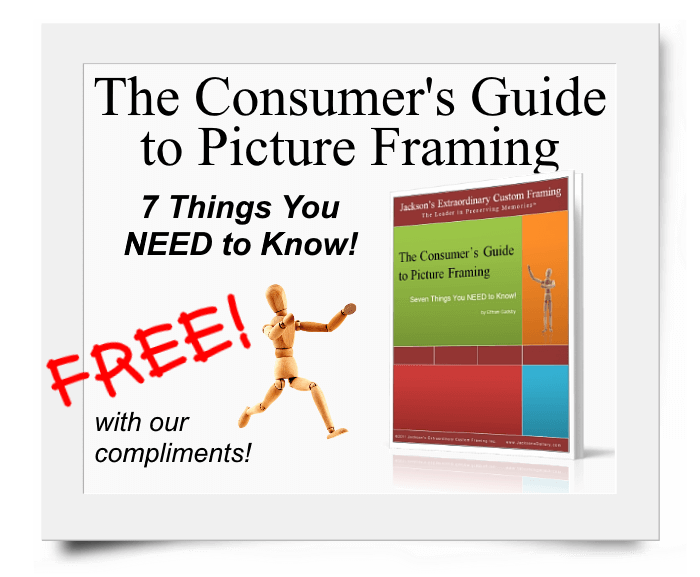 One of only 23 Certified Picture Framing Competition Judges in the world! Check out our Awards and Distinctions! So Your Project is Done Right!